Buddha who is the founder of the Buddhist religion is called Buddha Shakyamuni. 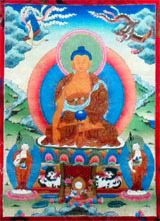 “Shakya” is the name of the royal family into which he was born, and “Muni” means “Holy One.” Buddha Shakyamuni was born as a royal prince in 624 BC in a place called Lumbini, which was originally in northern India now part of Nepal. When his mother Queen Mayadevi and his father King Shuddhodana saw the child, he felt as if all his wishes had been fulfilled and he named the young prince “Siddhartha.” He invited a Brahmin seer to make predictions about the prince’s future.